Have you ever needed to create a unique map? I have in the past for wedding invitations, birthday parties, and team spaghetti suppers. Technologies have changed over the years and the types of maps I have created have changed with the technology. Most recently, I wanted to make a surprise map for my husband, David of all the hiking and cross-country ski trails we have blazed around our neck of the woods. The new techniques I brought to this map was combining iPhone GPS technology with Google Maps and my computer page layout software. I'll leave the techie stuff for my tutorial post tomorrow. Today, I'll share the map. 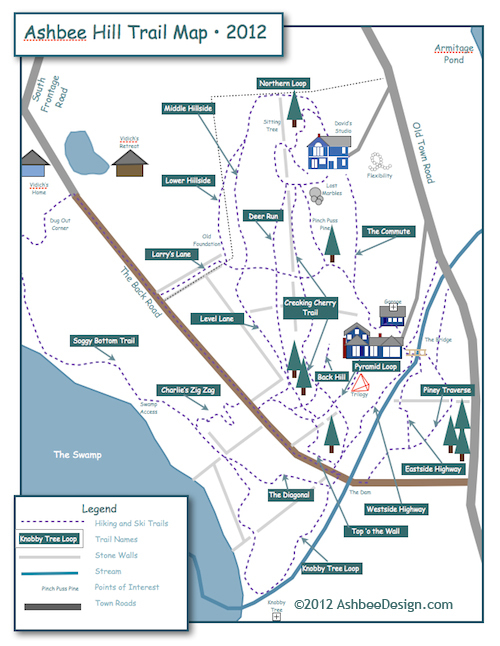 The map is designed to be printed on an 8 1/2" x 11" piece of paper and visitors can use it to guide them on the the many trails snaking through the woods. It is reduced to fit into the requirements of the blog but I'll include some detail shots. I created stylized shape drawings depicting the main architectural characteristics of our home, garage and David's studio. Initially I had used small photos of the buildings but they conflicted with the other visual elements of the map. I also made little iconic drawings of the major sculptures we have built during our sculpture vacations. Trilogy is the red pyramid in the above detail. 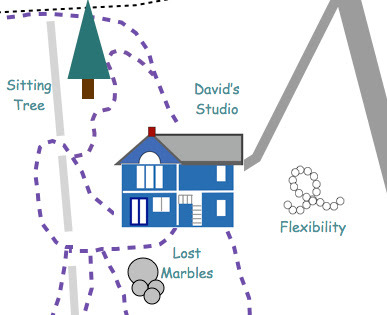 Both Lost Marbles and Flexibility are near David's studio. All have been subjects of previous posts. I also included the bridge we built last summer which figures prominently in our trail system. The maps includes trails, streams, stonewalls, roads and points of interest all defined in the legend. I have used the drawing tools in page layout programs to create maps in the past. 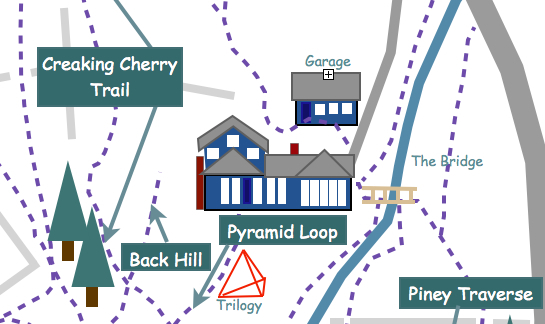 For this map I used Pages from the Apple iWork series. The project started with using the GPS capabilities combined with the camera in an iPhone to establish accurate locations. Using Preview (which is a utility built into the Mac) I was able to easily transfer these to Google Maps and create a basic map there. 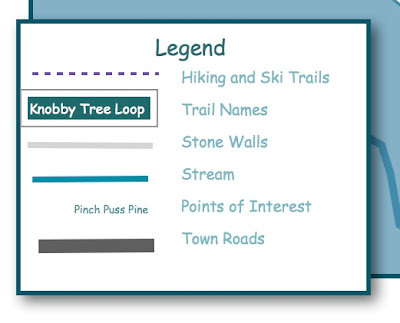 I took a screen shot and transferred that into Pages where I was able to add details, text, labels, etc. and work on the design. I'll provide more details on the process in the next post. Update: The tutorial is now posted here.